Home Beans	Why Are These Beans Sick? And is it Safe to Compost Sick Plants? Hi, David! Remember a few weeks ago when I sent you a picture of my beautiful snake beans? 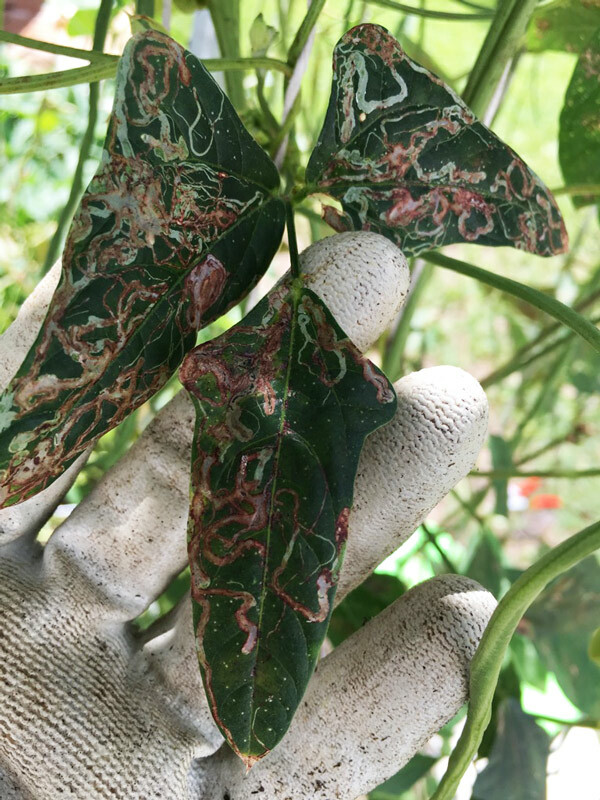 I’ve had leaf miners pretty much since the beginning, and we read that they make the leaves look a little weird but they won’t damage your plant. …and some look like they have rust spots. 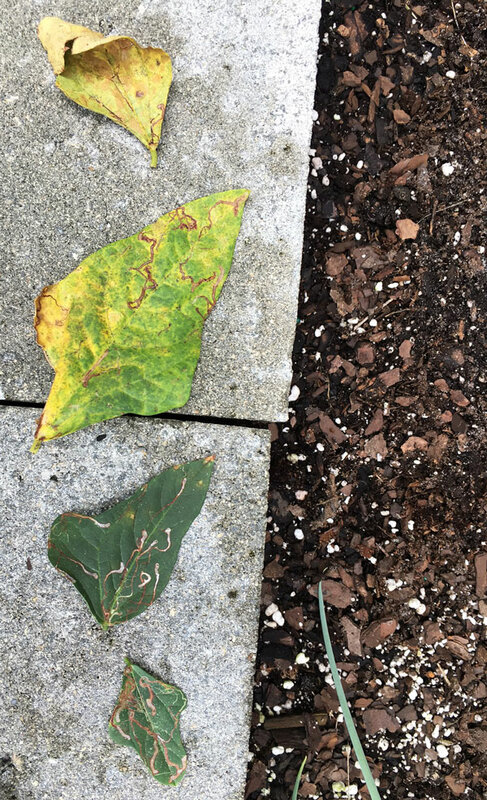 What can I do about leaf miners on other plants? I’ve started squashing them inside the leaves, but I probably can’t do every single leaf. Do these plants run their course toward the end of summer? Or do I have some sort of problem here? I go out every single morning to harvest, and I haven’t seen any bean beetles or really any insects on the plants except for small ants. They’ve also been there since the beginning. We had aphids for a few days, and I released some lady bugs and we haven’t seen one aphid since then. That was June, I believe. There was a wasp that was always buzzing around, but I haven’t seen him in awhile. As you can also see here, the vines are starting to have brown spots on them. That may be normal, I’m not sure. I didn’t really pay attention at the beginning because I was so enthralled with the beans, but now I’m looking for every little thing that could be wrong. I won’t be too upset if we have to pull out this plant because we’ve gotten TONS of beans from it, but I’d love to keep it and let it produce as long as possible! The other day I cleaned up all of the fallen leaves and stuff under the plant, and when I did I found a weird bug that looked like a slug or a leech. It was black and slimy. Anyway, I cleaned it all up and fertilized and mulched. My husband has occasionally peed on the plants this summer like you recommended. As a new veggie gardener, I’m not sure what to do. I don’t want to spray anything if I can help it. Did I tell you I have leaf miners on some of my other plants, too? Passion flower, okra, and already some on my tomato and tomatillo seedlings!! 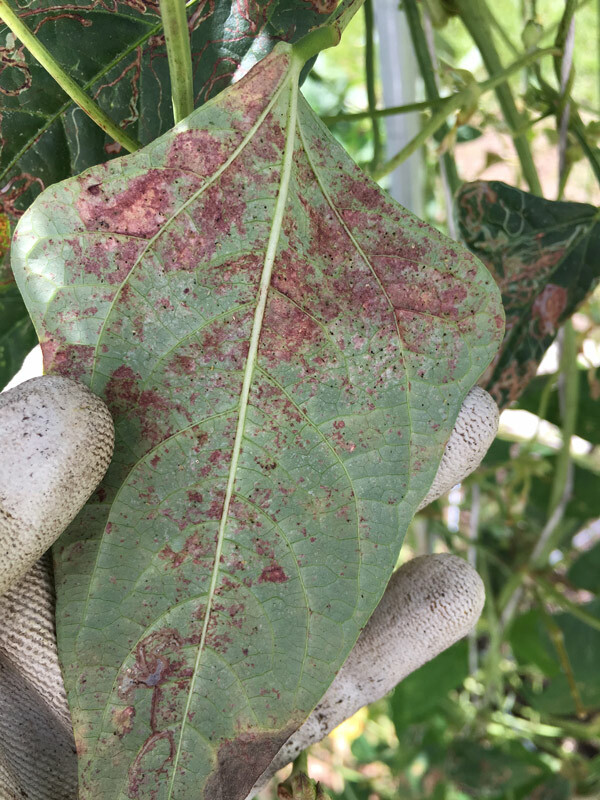 And spider mites on the milkweed. Really bad. Completely webbed over the blooms and leaves. I cut them down and they’re looking good again now, but the pests make me sad. I feel like it’s a battle I can’t win. 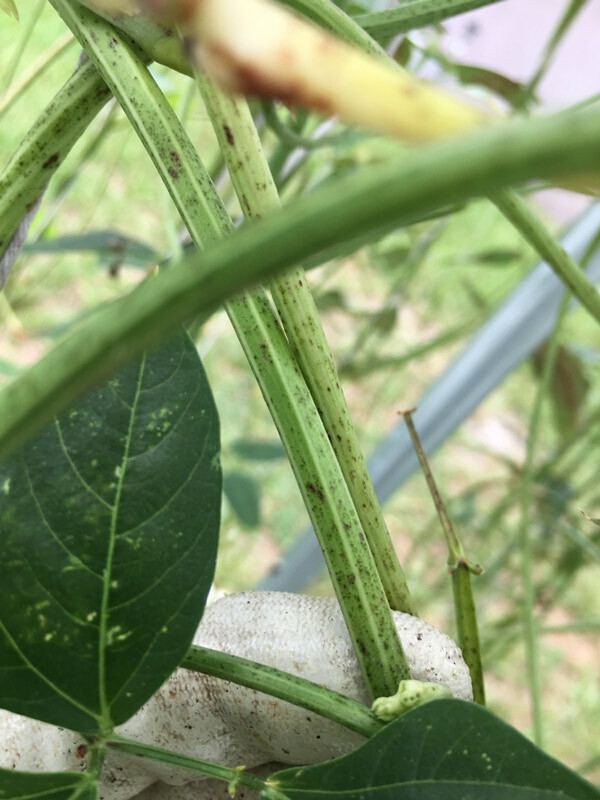 Over the last month, there have been 2 or 3 “stunted” beans – they got fat and were bulging with beans inside the pod, but the pod was only maybe 5-6″ long. 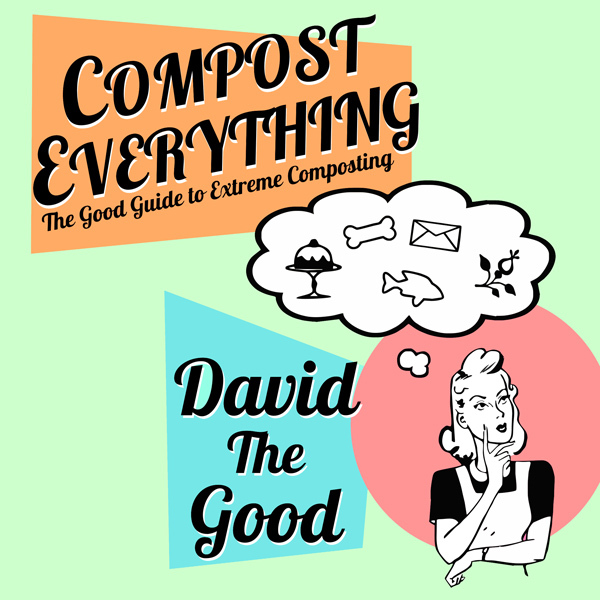 I figured not every bean is perfect, so I composted those. I’ve composted several fallen or yellow or leaf miner-damaged leaves, thinking that the nitrogen would be good for the compost. This morning when I went out to harvest, I noticed that the beans haven’t grown much since yesterday. This is totally abnormal, as you know. If I leave a few long-ish beans on the plant, they will be monsters the next day. I’d appreciate any thoughts or advice you have time to impart! Again, thank you so much. I realize that this is all an experiment, but I want to be sure not to damage the rest of my garden with diseased plants in the compost. I am starting to get pretty discouraged by the pests. Anyway, sorry for the super long email! I appreciate you and your blog and your videos. Thank you! Guess I’m obligated to answer now, darn it. So What’s Wrong With These Yard-long Beans? As I wrote Kerri: in short, they’re old! Snake beans, though more vigorous and productive than the other beans I’ve grown, must eventually come to an end. 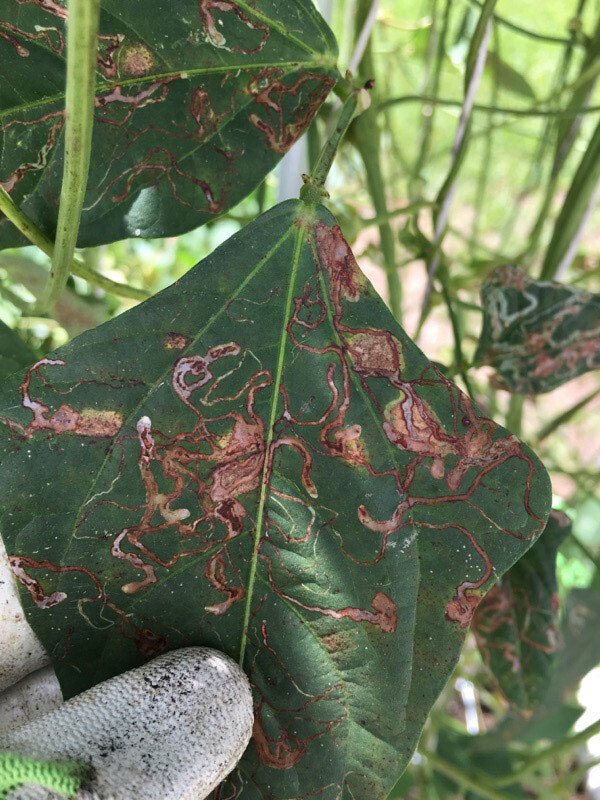 The leaf-miners are a common problem, as are aphids. Rust and mildews tend to only be a problem as the plants near the end of their lives, though. I don’t worry about any of these issues since the plants aren’t usually phased by them. 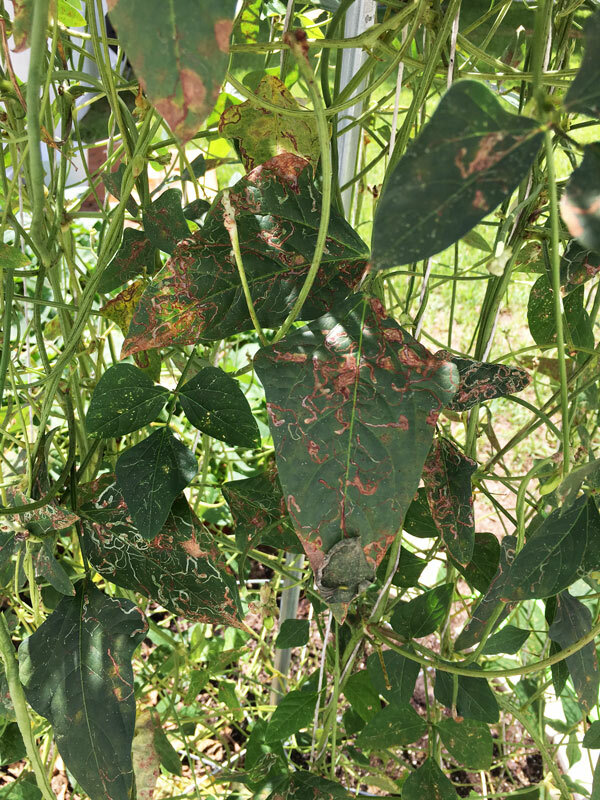 One reader told me he had to quit growing yard long beans because they were completely eaten up by aphids, so I know that can be serious on occasion, but it hasn’t been a problem in my gardens. I have a hunch it’s because I maintain swaths of weeds and perennials as places for predator insects and other beneficials to hide. My guess on how long we usually harvest yard-long beans would be about two months. 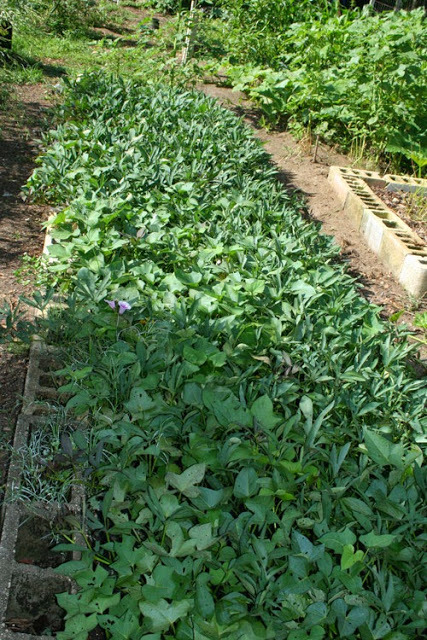 If you plant a new round of beans every month or so through the spring, summer and fall, you’ll quickly have more beans than you can eat. There is a point where the beans just give up and that’s what I see happening in Kerri’s garden. Just plant more! 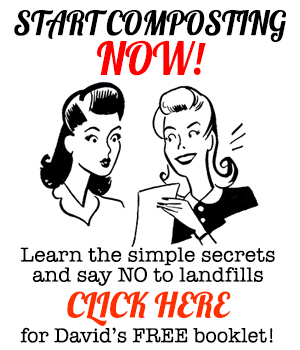 Can You Compost Sick Plants? I won’t compost any perennial with fireblight (those get burned for charcoal or ashes), but I’m not really worried about the common issues I see in the annual garden like mildew, black spot, etc. Those diseases, in my opinion, are just passing seasonal conditions that are likely to be completely destroyed in the active microecology of a compost pile. I haven’t had any trouble with diseases returning via compost, so far as I can tell. They seem more linked to climate conditions and crop rotation than to throwing yesterday’s plants into the pile to feed tomorrow’s seedlings. Finally, thanks for taking all the nice pictures, Kerri. You should consider switching to black and white and approaching gritty urban art galleries. Worm-traced II: (Plague series). Xeroxed kodachrome on canvas. Kerri, 2016. Keep on keeping on, Kerri. Don’t worry too much. The next round of beans you plant for fall should fly. 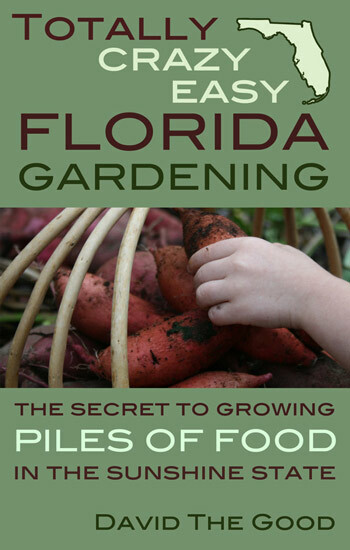 If you are a Florida gardener, you really should own a copy of Totally Crazy Easy Florida Gardening. I tested a bunch of crazy vegetables with the goal of more food and less work. You will have success if you follow my suggestions. 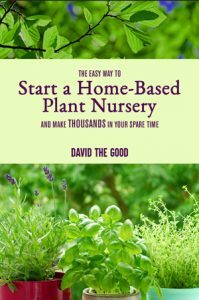 No other Florida gardening book takes this approach of growing what works instead of trying to force success with chemicals and ill-suited vegetables. 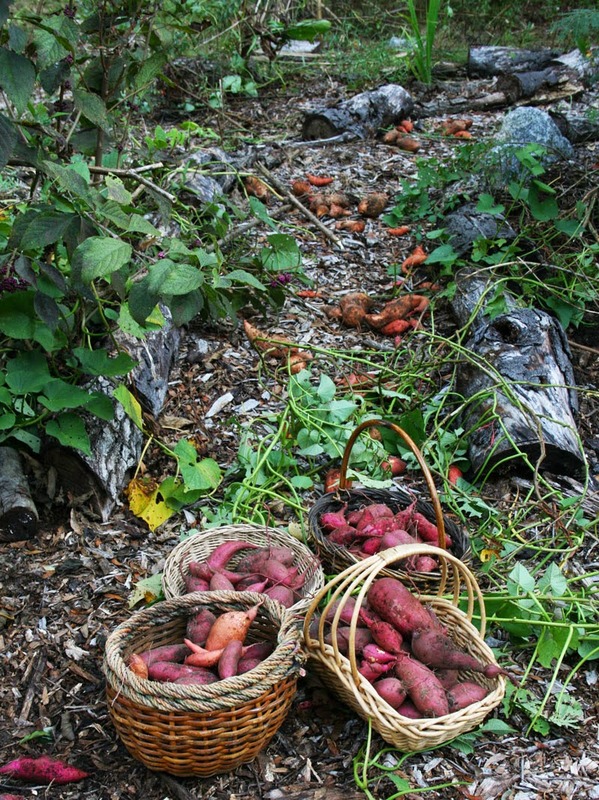 Kerri’s beans produced a ton before reaching the end of their natural life. My book will cut your grocery bill down to a sliver. Give it a try. How To Identify Cogongrass - the WORST Invasive Plant! I feel her pain, I’m new to gardening and I also take it personal when my plants have problems. I rest on your vast experience and easy going attitude towards failures in the garden. I want to thank you for that leadership. I also garden in flip flops, in Fl. you have to. I have nice feet but I’m guessing you don’t want to see pictures of them, lol. I still get upset over losing plants sometimes. I had seeds for a rare perennial tree tomato. Planted 25. Two came up. One of those two wilted away, leaving me with one. It grew nicely, with broad leaves, reaching about 5-6″… and then one morning I saw it was wilted. A caterpillar had gnawed half way through the side of it and was curled up in the pot. I smashed the beast… but the plant didn’t recover. 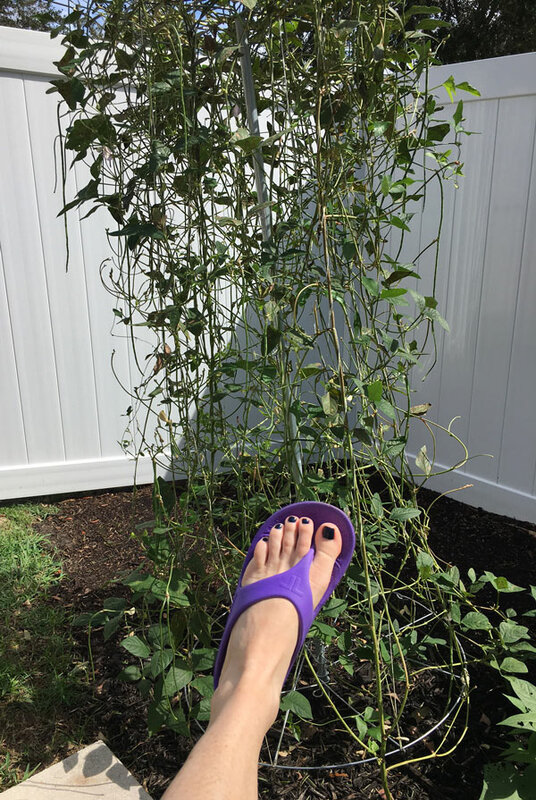 I try to garden in flip-flops but the fire ants always get me. Well, reading that email on the blog, I see that I am QUITE long-winded! Good grief! Anyway, thank you so much for answering my questions. I won’t tell my husband that there’s evidence online of his peeing on the beans. BAHAHAHA! I pulled out those plants, moved the pole, and planted more on Saturday. Yesterday I noticed 3 little plants poking their heads up. Now I get to watch them grow all over again and annoy my family by sending them constant pictures! Yay! And you’re right, we got about 2 months of harvest. We planted in early June, started harvesting at the end of the month, and just pulled it up in early September. Wonderful, amazing beans. You’re the best, David. 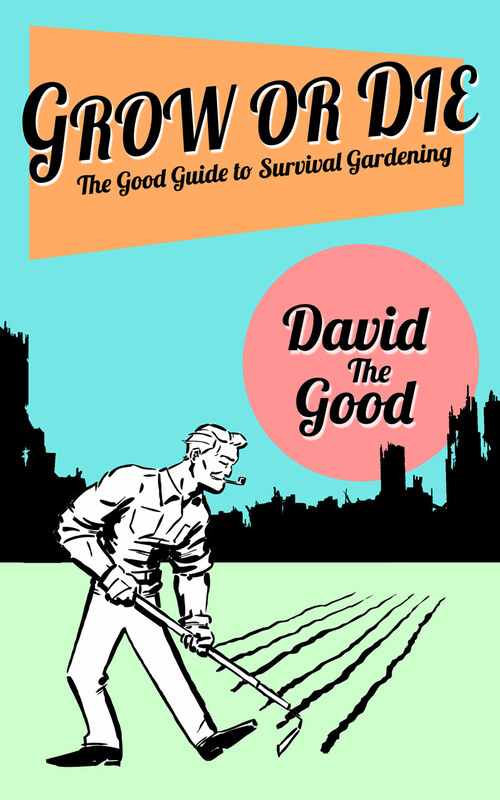 Thank you so much for all of your books, all you do, and your friendliness and kindness to beginning gardeners and all gardeners! 😀 God bless! PS – the picture comment from you is the funniest thing I’ve seen in a long time. Gotta love the iPhone for quick pictures to send to your gardening guru!